Full disclosure: in Exodus 2, the sister of baby Moses isn’t named. Traditionally she is assumed to be Miriam, because this is the only sister Moses is ever mentioned as having. 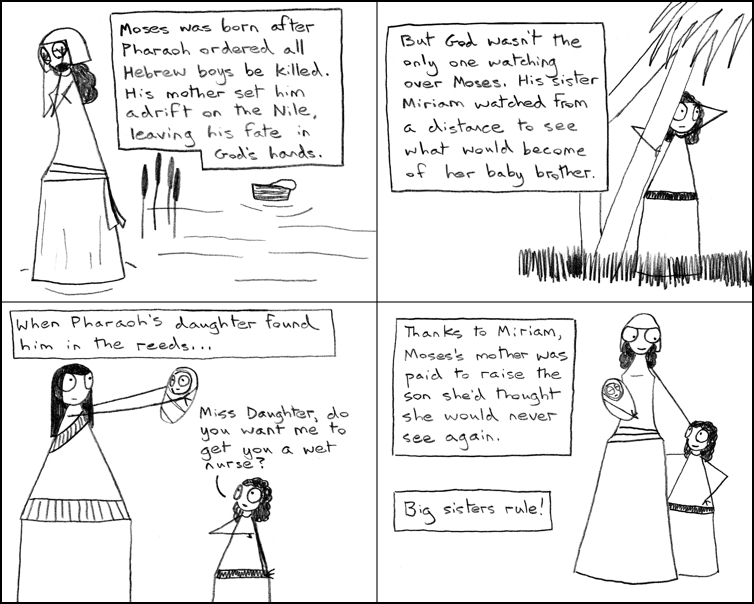 Pharaoh’s daughter and Moses’s mother are similarly not named in Exodus, but tradition names them as well: Bithiah and Jochebed. Women: we were there too! Jochebed sounds like a noise you make when you sneeze, to be honest. It could be “Yocheved” if you prefer. Lots of those Bibley names sound funny to the American ear — how about “Habakkuk” or “Nebuchadnezzar”?